China on May 19, 2016 unveiled a guideline for a national strategy that maps out three major steps to promote the country's innovation-driven development. The document, jointly published by the Communist Party of China (CPC) Central Committee and the State Council, pledges to build China into an innovative nation by 2020, and an international leader in innovation by 2030. The blueprint vows to make China a world powerhouse of scientific and technological innovation by 2050, the third step of the strategy. Wan Gang, the country's science and technology minister says nine areas will be at the center of efforts to drive innovation, focusing on converting technical fruits into business. "The outline lists nine areas, including information, intelligent manufacturing, modern agriculture, modern energy, ecological environment protection, ocean and space, new-type urbanization, health and modern service. These are the key areas we'll concentrate on in the future," said Wan. "First we abolished the approval procedure. We give them rights to deal with their research results and make profit out of them. Researchers can get over 50 percent of profits. The most important thing is to set up a service mechanism, to help companies, colleges and institutes with the conversion," said Wan. According to the document, Innovation-driven development requires making innovation the primary driving force for development. It also calls for integration of innovation in scientific and technological fields as well as in systems, management, and business models. The guideline demands efforts to construct a new driving force for development and to build a national innovative system. It also highlights quality and efficiency of development and the leading role of innovative factors. Moreover, it urges promoting the talent pool and stimulating mass innovation to implement the strategy, while pledging greater investment in innovation. The document puts forward missions for developing technology in information networks, modern agriculture, energy, environmental protection, oceanic and space industries, and health and service industries. Research in fields related to the country's strategic demands and which helps solve bottlenecks in the country's long-term development and national security should be strengthened, it said. China's total R&D expenditure exceeded 1.4 trillion yuan last year, or about 215 billion US dollars. More than 77% of this came from the business sector. But in China, key and core technologies are still controlled by other countries. Many industries are still at the lower-to-medium ends of the global value chain. The priority now is to speed up converting college and research institutes' research results into business. China's economic growth slowed to 6.9% in 2015, and the government has set a 5-year GDP growth target of 6.5% to 7%. In the outline, technology and infrastructure investments figure prominently in what officials clearly hope is a new growth strategy less reliant on manufacturing and heavy industry. 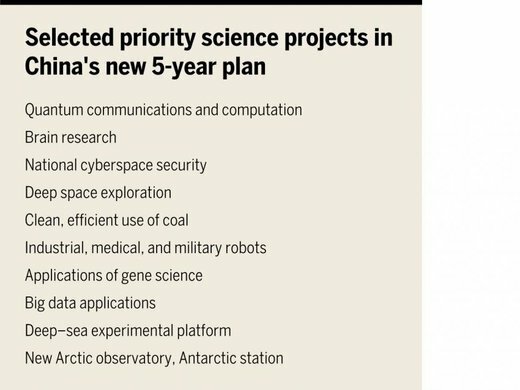 Themes in the new 5-year plan include the domestic production of gas-turbine engines and planes, and increased focus on neuroscience and genetic research, national cyberspace security, and deep space exploration. Chinese aerospace officials told state media last week they hope to launch a Mars probe by 2020. 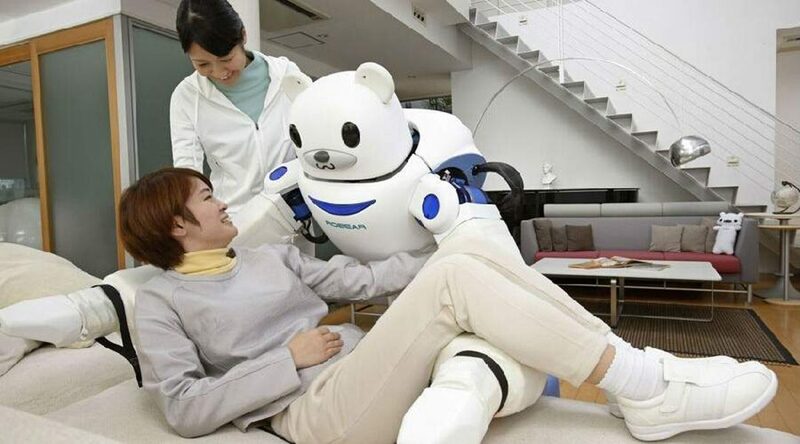 Big data, high-tech medical devices, and cloud computing also earned mention as priority projects.